Janet Hutchings: EQMM always takes pleasure in following the careers of writers who got their start in our Department of First Stories, but it isn’t often that we have the opportunity to look back on a fifty-year run of top-notch work from one of our own. In 2012, Josh, you blogged on this site about your long connection to EQMM. I’m thinking of the post entitled “Looking Back on a Half-Century Love Affair with EQMM.” Back then, however, you hadn’t quite reached the half-century milestone. Now you’re truly there. Josh Pachter: Yeah, I lied. At that time I had in fact been reading EQMM for forty-six years and publishing in its pages for forty-four, and, no matter how you slice it, half a century is fifty years and not a year less. So the love affair I’ve had with EQMM as a reader celebrated its golden anniversary in 2016, not 2012 . . . and my love affair with EQMM as a writer celebrates its half-century mark now, today, as we near the end of 2018. JH: Your contributions to EQMM extend well beyond your output as an individual short story writer. In addition to solo stories, you’ve done collaborations and translations. But let’s start with your solo fiction. It’s worth mentioning that your Department of First Stories tale was an homage to Ellery Queen. JP: Yes, as I described in my “Looking Back” post, my first appearance in print—not just in EQMM but anywhere—was a story titled “E.Q. Griffen Earns His Name,” which I wrote at the age of sixteen and which Frederic Dannay, half of the Ellery Queen writing team and the magazine’s founding editor, bought for the December 1968 issue. My character was, of course, named after Ellery Queen. During the first half of the ’70s, I followed it up with half a dozen more stories: another two about the Griffen kids, a spoof of several of Ed Hoch’s series characters, and a couple of one-offs. JH: After that, we didn’t hear from you for a while. What happened? JH: For some years after the Chaudri series, we mostly saw your byline on stories coauthored with a variety of other writers. How did you end up working with so many different writing partners? JP: In the mid-1980s, before anyone other than the military had access to the Internet, I was living in what was then Western Germany and came up with the idea of writing a series of collaborative stories that could be published individually in EQMM and other places and then collected in a book. I blogged about the project on this site in 2015, as “Partners in Crime.” The book never happened—it hasn’t happened yet, anyway—but most of the stories were individually published, several in EQMM: one was written with Ed Hoch (“The Spy and the Suicide Club,” January 1985), one with Stan Cohen (“Annika Andersson,” February 1993), and one with Jon Breen (“The German Cologne Mystery,” September/October 2005). In more recent years, I’ve written a couple of new collaborations for EQMM, including one with my Dutch friend René Appel (“A Woman’s Place,” September/October 2017) and—in what has been perhaps the proudest moment of my entire “career”—one with my daughter Becca (“History on the Bedroom Wall,” September/October 2009). JH: That story with Rebecca Jones was your second appearance in EQMM’s Department of First Stories—and you’re the only person whose name has ever appeared there twice! Since Rebecca was a first-time author, we felt we could stretch the rules and publish your collaboration with her under the First Stories banner. The topic of collaboration segues nicely into that of translation, since translation is, after all, a form of collaboration. You’ve been prolific as a translator in our field. What was your first translation? JH: It’s not only from Dutch and Flemish that you translate, though. Recently you’ve worked on translations from several other languages. JP: Yes, I’m always up for a new challenge. This year I translated stories from the Spanish (Luciano Sívori’s “The Final Analysis,” January/February 2018) and the Afrikaans (François Bloemhof’s “Proof,” September/October 2018), and I’m eager to tackle another new language sometime soon, possibly Turkish. JH: When I first asked you to contribute to Passport to Crime, in 2003, you weren’t writing much fiction of your own. Why was that? JP: When my daughter Becca was born in 1986, I got so involved in being a full-time dad that I went into writing hibernation again, this time until she went off to college. But right around the same time you invited me to begin translating for Passport to Crime, Becca told me she thought it was a shame that I couldn’t write publishable fiction of my own anymore. “I could if I wanted to,” I told her, “but I just don’t want to.” She shook her head sadly and said, “Sure, Dad, I’m sure you could.” Well, I couldn’t ignore such a blatant dare, and ever since then I’ve been contributing new stories to EQMM with some regularity. JH: So far we’ve been talking only about the ways in which you’ve enhanced EQMM’s fiction offerings over the years. But you’ve been a contributor to EQMM in a variety of other ways. This blog site, which you’ve provided with six posts, is one example. Let’s talk about some of the other ways in which you’ve lent your talents to EQMM. JP: Well, I’ve read two of my own stories and three of my translations for the monthly podcast. On September 30, 2016, I was on a panel (with Otto Penzler and Russell Atwood, moderated by Joseph Goodrich) at EQMM’s 75th Anniversary Symposium at Columbia University. I was the first speaker at the salute to EQMM at the 2017 Bouchercon in Toronto, and I was on an EQMM panel (with Sarah Weinman, Brendan Dubois, and David Dean, moderated by Dale Andrews) at the 2018 Bouchercon in St. Petersburg. JH: As you reflect on the last fifty years, what milestones stand out in your memory? JP: I’ve already mentioned my collaboration with Becca, which was an amazing high point. Other than that, probably the most memorable milestone for me is that I was in 1968 and remain today the second-youngest person ever to publish in the magazine. (The youngest was James Yaffe, who was only fifteen when he wrote “Department of Impossible Crimes,” which was in the Department of First Stories in the July 1943 issue.) Something else I’m proud of is being the only person who ever collaborated on a piece of fiction with EQMM Grand Master Edward D. Hoch, the most prolific of all EQMM contributors. And I’m also one of the small handful of people who’s published new work in the pages of EQMM in six consecutive decades: the ’60s, ’70s, ’80s, ’90s, ’00s, and ’10s. JH: And that brings us to today. To celebrate your half-century as an EQMM contributor, EQMM has just published a new story of yours entitled “50,” in which we see E.Q. Griffen, the protagonist of your first story, fifty years older. Was it hard to reimagine this character after so many years? JP: I already knew where my Ellery would wind up as an adult, since Becca and I put an Easter-egg reference to him into “History on the Bedroom Wall.” That story is told in the first person by a student at Middlebury College in Vermont, and the narrator refers to a “Professor Griffen” who teaches English lit there. So “50” begins with sixty-six-year-old Professor E.Q. Griffen sitting in his faculty office at Midd, preparing a lecture on Robert Frost—and the professor then gets to match wits with his teenaged self and tackle a dying-message murder both he and his police-inspector father failed to solve back in 1968. JH: That story is in our current issue (November/December 2018), exactly fifty years after your debut in December 1968. Readers who’d like to read or listen to the original story, can find it in text form on EQMM’s website, or listen to your reading of it in this month’s EQMM podcast. So, having come this far, Josh, what’s next? JP: Well, you’ve recently bought two new stories from me. One is a standalone, “The Secret Lagoon,” which is set in Iceland, and the other one is what I hope will be the first entry in a five-part series. It’s called “A Study in Scarlett!,” and it’s my first-ever straightforward pastiche—a fond and hopefully authentic imitation of (who else?) Ellery Queen. Back in the 1960s, Dannay and Lee wrote six stories about a group called the Puzzle Club, a precursor of Isaac Asimov’s later “Black Widowers” series. My plan is to write five new Puzzle Club stories for EQMM in the style and spirit of the original five, and then hopefully release all ten stories as a collection “by Ellery Queen and Josh Pachter.” I’m hoping that one of them might appear in a 2020 issue, which would make me the first person to publish a new story in the magazine in seven consecutive decades! Will I make it to eight? I hope so, and not just because that would grant me another ten years on the planet but because it will mean that Ellery Queen’s Mystery Magazine, which has been an integral part of my life for more than half a century, now, will remain a part of my life—and, I hope and trust, the lives of all of its fans and readers—for at least another decade. JH: That’s our wish too, Josh. Happy Anniversary! 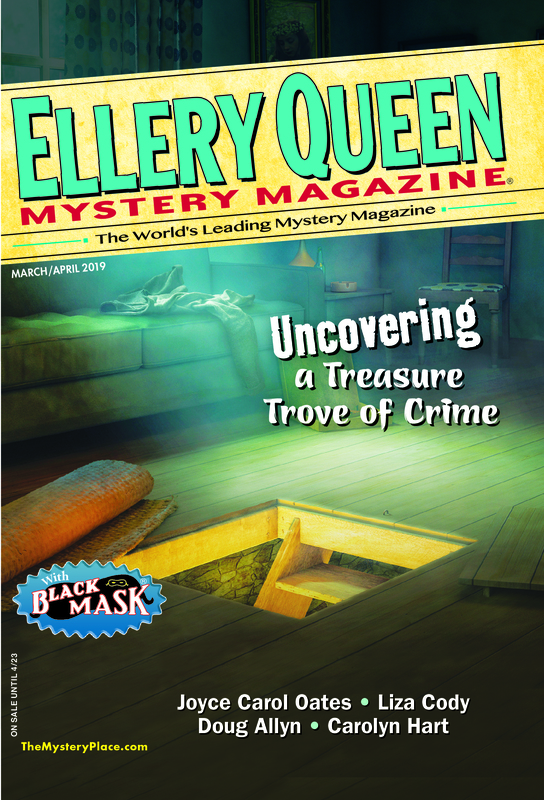 This entry was posted in Characters, Ellery Queen, Fiction, Genre, Guest, History, Interview, Magazine, Writers, Writing and tagged career, ellery queen, Interview, josh pachter, magazine, print publishing, writer, writing. Bookmark the permalink. A marvelous interview—congratulations to Josh and EQMM on fifty (and counting) happy years! So much enjoyed this! Congratulations, both!